If you’re currently using a drill or mill for making holes in shaped parts and frustrated with the time it takes, you’re missing out. More holes in more parts per hour. If you’re finishing 400 parts in a day now, imagine 2,400 instead. 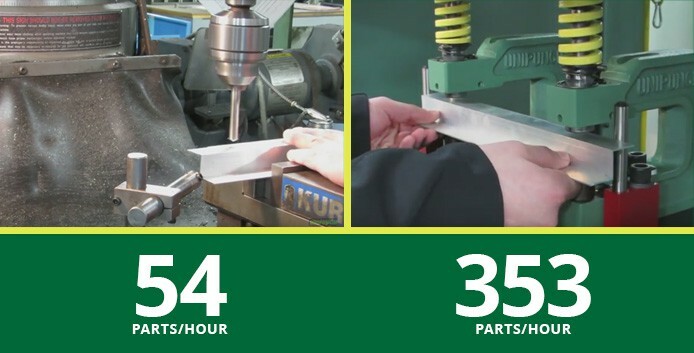 We can provide most UniPunch tooling within days, so there’s no need for you to wait months. Faster changeover from part to part. Tell Us About Your Job and We’ll Help You Make Holes Fast! Our experts have helped thousands of manufacturers increase their speed of production. Call us at 1-(800)-828-7061 or fill out the form below, and our team will recommend the right UniPunch solution for your needs. Yes, please add me to the UniPunch mailing list. How fast can UniPunch send tooling to me? Fast—often within days. The nice thing about modular UniPunch tooling is that it’s available off the shelf, so even if a project needs some customization, you can still be in production quickly. Can Unipunch make more than one hole at a time? Absolutely! This is just one of the ways that production with UniPunch can be so much faster. What materials can be punched with UniPunch? UniPunch is commonly used on mild steel, stainless steel, A36, aluminum, copper, brass, composite materials, fiberglass, plastic, and rubber. What kind of shapes can UniPunch make? While UniPunch can be customized for almost any shape, here are some of the most common shapes. How do I know which UniPunch tooling I need? That’s what our experts are here for. Give us a call at 1-(800)-828-7061 or fill out the form above and we’ll recommend the right setup. You can punch a variety of standard and custom shapes in sheet metal. Learn how you can have our sheet metal punch tooling designed to for your applications. UniPunch uses C-Frame technology to punch holes in sheet metal and other applications. See how this unique system works to punch holes in sheet metal and other materials. With a UniPunch sheet metal hole punch tooling and dies, you get distinct advantages, specifically speed. Discover 7 ways UniPunch outperforms other sheet metal punch tooling. And many more! Call us at 1-(800)-828-7061 or fill out the form above, and our team will recommend the right UniPunch solution for your needs. Tell us about your project, and we’ll recommend the right UniPunch solution for your needs.